In the heyday of the muscle car era, Detroit produced 10 if not hundreds of different models that people considered as muscle cars, ranging from the compact Mustangs to the full-size Impala SS, and from two-seater Corvettes to the luxurious Riviera GS. It seemed as if the streets were filled with powerful machines ready to burn rubber in and stop light race. Most muscle car aficionados of the period bought coupes or hard tops simply because that body style was the lightest; thus, it was the fastest. Convertibles were reserved for cruising and even when they had the top of the line engines, they were still slower than their closed body counterparts. For this reason, muscle car convertibles are considerably rarer, cooler and far more sought after by serious car collectors. Here is a list the rarest muscle car convertibles and open top cars that Detroit produced in that glorious period between 1964 and 1971. Most of the models on this list are top of the line versions or limited editions, making them extremely rare and valuable to collectors of today. Buckle up and keep reading to experience the perfect mix of raw Detroit horsepower and the magic of open air driving. One of the most successful collaborations between a major car company and a small aftermarket outfit was the deal between Hurst and Oldsmobile. Back in the late 1960’s, Hurst transformed the Oldsmobile 442 into one of the fastest cars available on the North American market. They equipped them with their famous shifter, and added their signature gold and white or black and silver paint jobs. At the time, Oldsmobile was under GM`s ban that forbade the company from putting engines larger than 400 CID in intermediate cars. This meant the popular 442 model couldn’t receive the biggest available engines. Due to that, it was inferior to Mopar muscle cars that had engines of up to 440 CID under their hoods. However, since Hurst was an independent company, GM rules didn’t apply. So, Oldsmobile shipped partially disassembled 442s to Hurst where they installed the biggest engine Oldsmobile had, which was the mighty 455 V8 with 390 hp. The Hurst Olds package also got numerous other performance upgrades like a ram air induction system, a heavy-duty suspension and updated brakes. Since the Hurst Olds was a limited production factory hot rod, it was expensive, so they didn’t produce a convertible. 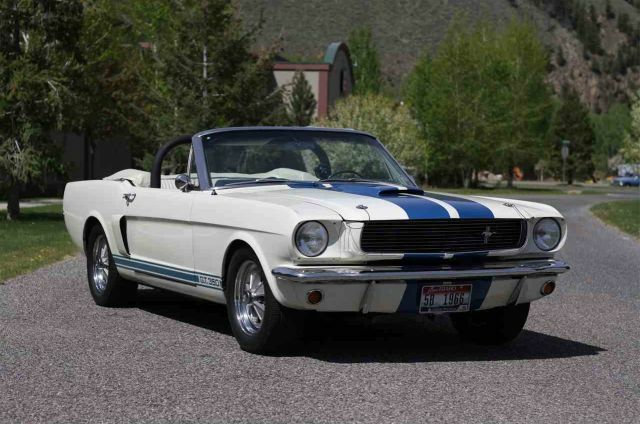 But, in 1969, Hurst made three convertibles for promotional purposes only. Fully dressed in an eye-catching gold and white paint scheme with a white top and interior, a rear spoiler and Oldsmobile Rally style wheels, they toured America promoting Hurst alongside a famous muscle car pin up girl, Linda Vaughan. They even had a big replica shifter on the back and a place for Linda to stand on while driving around the raceways doing promotional work. In 1969 Hurst Olds production was exactly 909 cars, which included 906 regular coupes and three crazy-looking convertibles with 455 V8 engines and 390 HP under the ram air hood.